The USA Sieger Show is a three-day event. Entry is limited to German Shepherd Dog’s listed in the USA Breed Registry or other FCI recognized breed registries. All dogs shown in classes 12 months and older must be registered with USA when owned by a resident of the United States. A Breed Survey is not provided. These Sieger Show rules are based on USA’s breed show regulations, which are also binding unless otherwise stated here. Entrants are advised that they must submit the original, proper pedigree and registration papers of the dog during check-in, as well as proof of training titles, breed survey papers, and hip certification, if applicable or awarded. Acceptable training titles are SchH, IP, DPO, HGH, and others deemed acceptable by the Breed Advisory Committee. Dogs brought to the show must provide proof of proper vaccinations required by law. Not acceptable are dogs that seem to be not healthy or have an unhealthy appearance. Dogs who are not entered in the show cannot be brought to the show grounds. Immediately after the performance test all dogs that receive the evaluation pronounced will then be judged in the standing examination. Judging will continue on the third day of the event after the judging of the Progeny Groups and Kennel Groups. The judging in each class starts with the stand exam. The judge carefully studies the anatomy, structure, and character of the dogs. Also, the character of the dog is tested and the judge will always observe the dog in this respect. There will be a test for Gun sensitivity steadiness in the rings. Puppy Classes are excluded from this test. Once this judging has been completed, the dogs will be required to start gaiting. The function of the bones and muscles, firmness of the ligaments and joints, rhythm of movement, strength and endurance, as well as liveliness are now very carefully evaluated. To qualify for a V-Select rating, dogs must have currently a breed survey ranking of Class 1, have complete and faultless dentition or must have a dental notation as established by the breed book office, the “a” Stamp or OFA Certification and must have at least a SchH 2 title or equivalent. They must come from a survey and performance breeding dogs competing for the V-Select rating a second time must have a SchH 3 title. The age of the dog for determining the proper class and other requirements shall be its age on the day prior to the first day of the show. Each Kennel Group must have no more and no less than (5) five dogs that possess the name of the kennel. These dogs must come from at least two different mothers and two different fathers. Dogs entered in the kennel group must also be entered and shown in a regular class. The most possible uniformity, the most possible combinations of parents, and the quality of the individual dogs in each group are the basis for the judging of the Kennel Groups. Each Progeny Group requires a minimum of at least six (6) dogs. Dogs exhibited in the Progeny Class must also be entered and shown in a regular class. There is no entry fee for this class. The judging of the Progeny Groups shows the quality of the progeny produced by the often-used stud dogs. It also shows which positive and negative factors may have been inherited by their offspring and what to look for in the future breedings of these dogs. Therefore, it is required to show all dogs belonging to the Progeny Group. It is not necessary that the stud dog be shown in the class. The Kennel Groups and Progeny Groups will be judged before the judging of the gaiting of the Working Dog Classes. All dogs of the Working Dog Classes must participate in the Sieger Show Performance Test. There will be two (2) helpers; one for the “attack on handler” and one for the “pursuit and courage test”. The dog has three (3) tries to perform the free heeling exercise to the attack on handler and must reach a predetermined distance from the blind (20 feet) to pass. The actual attack will commence when the dog is between 10 to 15 feet from the blind. The distance from the starting point of heeling to the blind will be 60 feet. The judge will evaluate the gripwork as it is described in USA’s Schutzhund Rule Book, “The dog should counter the attack securely and energetically in stopping the attack by the helper.” A lack of self-confidence in the gripwork shall be evaluated as “sufficient” in courage. The “out” should show the dog clearly off the sleeve and in the guarding phase. The only command permitted is one word for the out such as: out, aus, or any other single command of out. The commands of sit or down to affect the out are not permitted here. The dog, however, may sit, down or stand upon the out command, but may not bother the helper. The sit or down may be reinforced at a distance of 10 (ten) feet, if necessary as the handler approaches the dog. The handler should, after the attack, leash their dog without physical restraint (such as, grabbing the dog to prevent re-grip). The dog may receive an extra command to out to put the leash on the dog with no penalty; however, the dog that must be physically restrained or taken off of the sleeve physically will be disqualified. Once the dog is secured on lead, this exercise is over. On the pursuit or the long grip, the dog may be held by the collar but not verbally or physically encouraged. 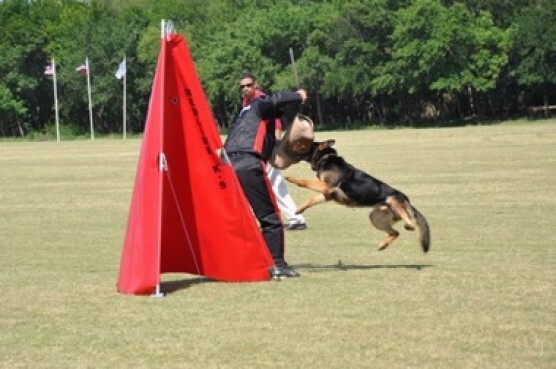 The dog should be at the basic position to initiate the release as the helper proceeds to the middle of the field to start the exercise. The handler will release the dog upon a signal from the judge. 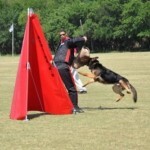 The gripwork and the out will be evaluated the same as in the attack on handler. Dogs that do not demonstrate a correct performance test cannot receive the rating of Excellent-Select (VA). Dogs that continue to bump or re-grip after the “out” will be placed at the end of whatever conformation rating they would achieve. Dogs that do not perform the free heeling exercise within three (3) attempts, or dogs that do not perform the “out” exercise, or dogs that receive the evaluation of “sufficient” or “insufficient” cannot continue in the competition of the show. No rating is given.